Nothing beats a hot plate of french toast for breakfast. The problem is who wants to spend all that effort right after waking up to make a batch of it? Not me! Well, I have a solution for you! Make it ahead of time, toss it in the freezer and then all you need to do when you want some is pop a couple pieces into your toaster. Tah dah! Near instant french toast with no work. Mix together all non-bread ingredients. Heat a skillet or frying pan over medium heat. Dip a piece of texas toast into the batter, making sure both sides are covered. Let the excess drip back into the batter bowl. This took about 1 1/2 to 2 minutes per side for me but may be different for you. If using a skillet, you can make multiple pieces at a time, but either way, repeat until all the bread is gone. You will have a little left over batter. Lay flat and flash freeze in your freezer for about 15-20 minutes. I had to do this in batches. Return frozen french toast to texas toast bag and place in freezer. 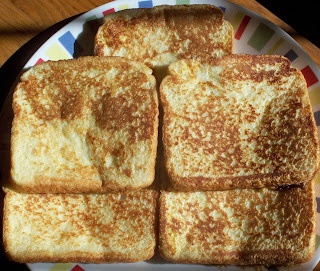 Toast in a toaster and serve with maple syrup whenever you want some delicious french toast.